This entry was posted in Blogging, Family, Happiness, Life Balance, Running and tagged Family, Healthy Eating, Life Balance, Running by txa1265. Bookmark the permalink. Love this – great post!! Entertaining and SO true!! OMG yes. Thank you for the slap in the face! It’s SO true. Even on the weekend, I have every minute scheduled. I have been experimenting (for one day, ha) with actually scheduling in time to decompress, which I know kind of defeats the purpose, but at least is a step in the right direction! Thank you :). Cool video by Chris!! He does have skillz! haha Megan – it is all about finding what works for you and keeps you going. If that means scheduling relaxation, that is fine – it is just always worth thinking about if we are trying to be organized in order to maximize efficiency to get as much ‘life’ as possible … or in order to have more time for more ‘stuff’. Thanks about Chris – he is great musically and takes awesome pictures, but has never really worked artistically with film … and he just floored us with some of his shots and setups. This was for his video class this term, and he also enlisted some of his fun friends. You’re tired from all our early morning boot camps! Remind me tomorrow to tell you about our BBD thing — you might enjoy it given this comment and your post. I think we all have our moments … and always have to work at just being. Because no matter how much we do – there is more. More laundry, more cleaning, more organization, more activities, more learning, more whatever … if we had more hours in a day we would STILL not have enough! And I think that so long as we are aware of it, that is a good thing, we just have to work on it – constantly burning the candle at both ends isn’t healthy (says the guy who averages 4-5 hours of sleep). As for movies – I think there is a line *somewhere* between movies you find boring and the ‘overtake of exhaustion’ from sitting down. For example, my wife has never seen all of ‘Close Encounters’ or ‘2001: A Space Odyssey’ – they are good insomnia cures for her, and that is something we laugh about. In the summer months, my weekends get booked SUPER fast–weddings, vacations, family events, races, house-sitting obligations… It’s crazy! This weekend, we don’t have ANYTHING scheduled, which is really rare. I’m looking forward to slowing the f$%& down and spending some time at home for a change! Yup, so true, so hard to do. I am past the point of not being able to watch movies and now I can barely read before falling asleep too! Also after you mentioned seeing the “not so easy” easy runs I am seeing them all over the place on blogs and social media and it’s kind of annoying, but one of those things that’s just not my business. People can run however fast they want and call it easy and I know I need to do what works for me. P.S that video was awesome I think he has some promising talent! haha – that was me last night … I planned 15 minutes playing a game for a review due on Thursday, then some reading – and fell asleep holding my tablet sitting in bed! Yes, we’ve discussed the ‘not so easy’ before, and my sole worry is that it is the express route to injury. Most people who do that I no longer follow … but there is one I haven’t unfollowed yet, and in the last few days at some point I saw some things that made me say ‘omg, if this person isn’t injured by the end of the year I will be genuinely surprised’. But again, their choice … and as you say we have to do what is right for us! This is great and made me think!! By taking the summer off to truly 100% enjoy life… I am a refreshed person come fall and ready to face it head on. By slowing the f down, I get to spend more time with friends and family than I normally would and that is huge!!! I also have a lot of “me” time as I don’t have kids and my husband isnt off with me…I always feel like I know my own self even better during the summer!! That is awesome – I know lots of teachers who continue to over-schedule all summer long and are STILL burnt by September! So that is awesome that you do it that way! Love this. I’m someone who always whines about the summer heat ha, but I also know I should enjoy every run I get regardless of whether it’s “fun” or not. Big Kid (oldest little guy I nanny for) is constantly telling the cars on his street to slow down because they do go way too fast for a neighborhood with kids. I love hearing him say that. Always a good reminder for numerous things in life! And i always love hearing the stories of the kids you nanny for … that they say ‘slow down’ is priceless! I like the Monster article. At my first real job I heard about another firm in big-law that required associates to take a sabbatical (can’t remember if it was 3 or 6 mos) after 7? yrs of work. I already knew enough about big law to know they wouldn’t do that if it didn’t benefit the firm. Most those associates had taken very little vacation in 7 yrs and the time off was mandatory, paid, and clearly good for the firm. That stuck with me. Now, I usually take all my vacation time every year because I strongly believe it makes me a better employee the rest of the days, a happier person in general, and because I don’t get a ton of vacation days (oh, and because of that burning desire to see the world, expand horizons, challenge myself, grow, etc. ; I’m not a beachy vacation person). I get significantly more vacation days in 2 years, and then I’m actually hoping not to use some of it. What I like about unused vacation is the idea of being prepared for an emergency. If something happened to our parents or something and I had to take some time off, it would be nice to have extra vacation to use. As it stands now, we take our trip in October usually, so I kind of gamble on not needing any the last 2 months of the year. I think that is really smart to force vacations … in my first job you could carry vacation, then they would ‘buy out’ anything left over a certain amount (more incentive to NOT take it) and eventually they paid it all out and had a no-carry policy, which is pretty standard most places now. And yet despite the talk, there is often a dis-incentive at many companies for taking vacation. Corning is actually pretty good about it compared to pretty much any other tech-industry company I have ever dealt with. TOTALLY agree with you on the running front. Ever since my tendonitis I have had to force myself to slow down a lot. It’s hard sometimes, but I really don’t want to go through anything like that again and I know some of that was due to the fact that I was going out at maximum effort almost every time. 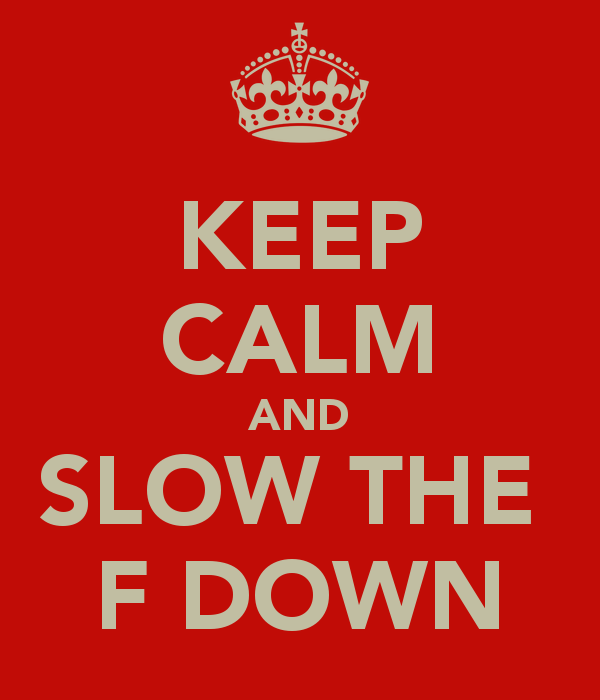 I ALWAYS find myself saying “SLOW DOWN” around here. We have the worst drivers and especially now where B goes to school people peel in and out of that parking lot. There are so many children around! It’s supremely frustrating. Over the past couple weeks I feel like I’ve had some great, slowed down moments with my family. Like our trip to the zoo. We just hung out there all day and enjoyed with no real agenda. It was marvelous! And honestly – I remember moving out here from the Boston area … and comparatively drivers here are MUCH more considerate, or slower, or there are just fewer of them, or something that made it feel less stressful. But a-holes will be a-holes, I guess! It is so dangerous – especially around schools. YEEEEEEEEEEEEESSSSSSSSSSSSSSSSSSSSSSSS Goodness gracious great balls of fire so true. You know what I like though? I think that my life right now has finally reached its groove. I am finding (I hope) a balance between the hurry ups and the waits. I have an amazing job, I savor my rests between my runs, but I also look forward to rebuilding my strength on my long runs. I am no longer in any hurry to move back east, or to…. whatever. I like the forward movement, but I am happy with my tempo. And that is something that I haven’t been able to say for a very very long time. The need to feel productive is a killer for me, constantly causing me to go faster faster faster in whatever I’m doing. Even something simple like putting together a pb&j sandwich, go faster faster faster so you can move on to the next thing. I regularly need to tell myself it is ok to be less than optimally productive. You’re going to make the sandwich, it just might take a bit longer. And if you don’t get to….whatever the hell you were trying to get to next, or next after that, or next next after after that, does it really matter? Usually the answer is no, it doesn’t matter, but it is still so hard to slow down. So true – there is just never enough time! And choosing to take a long run – with so many benefits – can really cram things even more! That is something that is very true yet counter our culture – being busy is not an accomplishment, getting stuff done is. Face-time at work is an evil thing, because it sends all of the wrong messages. Thanks for sharing! I so totally agree with this – it’s actually kind of a lifestyle I’m getting used to right now, and while it drive me nuts at first, now I’m loving it! Oh, and I think the self-hosted nature of my blog won’t let you do anything from the app… I’ve tried and tried to troubleshoot it, but can’t figure it out! Awesome – I love that you are in a place to be able to do this!